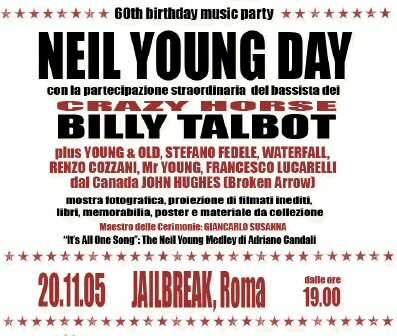 On November 20th, Wooden Nickel (the infamous CSN&Y fanzine) and the Italian website www.rockinfreeworld.135.it will organize the "Neil Young Day", an international convention in Rome to celebrate Neil's 60th birthday. It will be a special day with very rare & unseen footage, a special photo-exhibition with unique images, books, posters, memorabilia, a collectors' corner and an exciting evening of live music featuring several artists & bands including Young & Old, Stefano Fedele, Waterfall, Renzo Cozzani, Mr Young, Francesco Lucarelli. As special guest-star, Billy Talbot will join us for a rare & intimate acoustic performance, presenting his solo album.